The Central University Common Entrance Test 2018 i.e. CUCET 2018 conducted by Central University of Rajasthan (CURaj) for various UG, PG, Integrated and research courses. There are 8 central universities participated in CUCET 2018 i.e. Central University of Haryana (CUHAR), Central University of Jammu (CUJAM), Central University of Jharkand (CUJHD), Central University of Kashmir (CUKAS), Central University of Kerala (CUKER), Central University of Punjab (CUPUN), Central University of Rajasthan (CURAJ) and Central University of Tamil Nadu (CUTND). All 8 central universities offers 40 UG & integrated courses; 154 PG, BEd, diploma etc courses; and 73 Research courses. If you want to take into any UG, PG, integrated, research courses then first you have to participate into CUCET 2018. So, the cucet 2018 is only one key for get admission into all 8 central universities. 6) If your qualifying marks are in Grade/CGPA then please convert it into equaivalent percentage. So interested candidates fill CUCET application form from April 2018 to may 2018. CUCET Eligibility 2018 : Before applying CUCET 2018 all candidates must have to check their CUCET eligibility 2018 for UG, PG, integrated & Research courses. 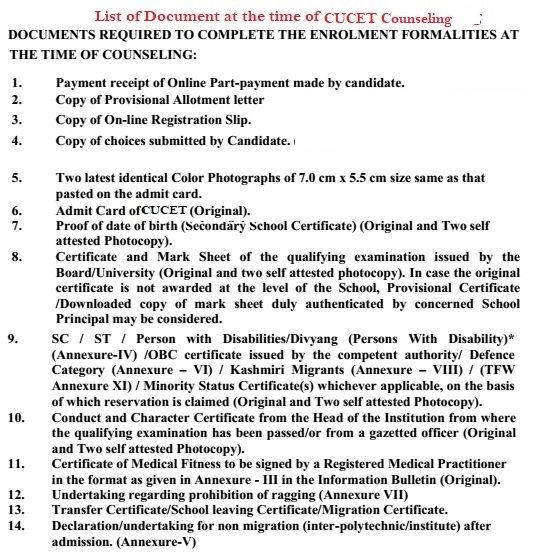 For Ug and integrated courses candidates should have 10+2 or similar certificate mark sheet; for PG courses candidates should have graduation degree from recognized university or similar and for Research course candidates must have master degree from recognized college etc. The cucet eligibility is different for different courses. 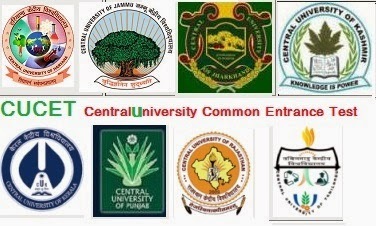 And all 8 central university offers many UG, PG etc courses and they has different types of eligibility for cucet exam. CUCET Syllabus 2018 : The CUCET exam conducted for various programs like UG, Integrated Programs(3/4/5 years), PG, B.Ed., Integrated M.Sc B.Ed/PG Diploma Programs(1/2/3 years) and MPhil, Ph. D Programs. In the CUCET 2018 exam for all ug, pg, research courses there are different syllabus for each courses. For UG courses there are two section available part A and Part B. In part A Language, general awareness, mathematical aptitude and analytical skills – comprising of 25 MCQs and in part B It will have 4 sections I to IV. Each section will comprise of 25 MCQs. The candidate has to answer any three sections. CUCET Admit card 2018 : As we know that the cucet exam held on June 2018 at various centers across India. Before the CUCET test the CUCET Admit card available on May 2018 on wards at official website. If you want to download CUCET Admit card please go to official website. CUCET Answer key 2018: After the CUCET test all aspirants and their parents are very eager to download CUCET answer key which will be available on official website of cucet test. 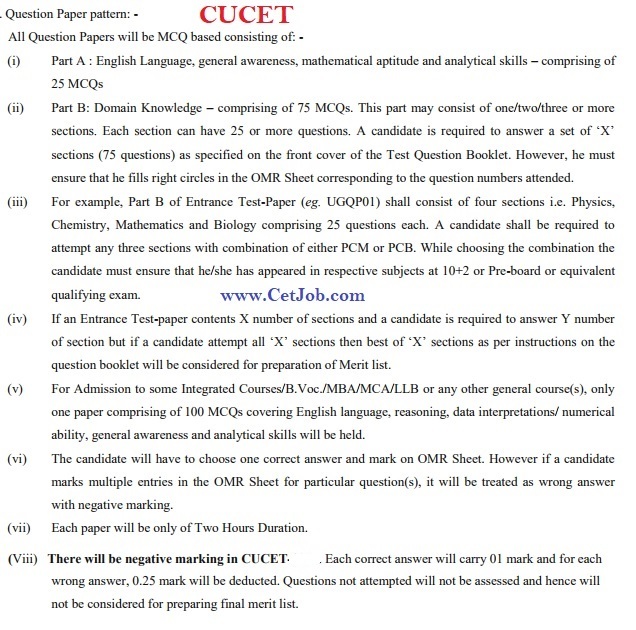 Before declaring CUCET results, all cucet aspirants relaxed with cucet answer key. CUCET Results 2018: The CUCET Results contain all information like CUCET rank, CUCET qualifying marks, got marks in CUCET test etc. As we know that the CUCET score card 2018 as well as CUCET results available on June 2018 at official website. People also search related with CUCET entrance test : eligibility criteria, syllabus, entrance exam, examination pattern, pdf, colleges rank wise, , seats available, cutoff for, predictor notification, toppers interview, previous year question papers, sample papers question bank, counselling result, counselling procedure, , seats, how many seats in , total seats in model question papers last date, download duplicate admit card , minimum marks for MTech MA MSc , MPhil , PHD , MCom , Integrated course , Central University Common Entrance Test MTech , Central University Common Entrance Test MA , Central University Common Entrance Test MSc , Central University Common Entrance Test MPhil , Central University Common Entrance Test PHD , Central University Common Entrance Test MCom , Central University Common Entrance Test Integrated course. CETJob © 2013. All Rights Reserved.